1. Was there a ‘duty of care’ owed by the defendant to the deceased? 2. Did a breach of that ‘duty of care’ lead to the death(s)? 3. Did the behaviour of the defendant fall so far below the standard that could reasonably have been expected that it warrants criminal liability? In the Grenfell Tower fire, the answer to the above questions is patently ‘yes’, in every case. Therefore, why have no indictments been issued, now five months later in what is apparently a prima facie case in which a catastrophic conflagration caused at least 70 residents to be either burned alive or asphyxiated by cyanide gas? Not one single person has yet been reported as having been prosecuted or indicted for criminal negligence and/or manslaughter in regard to the crime of causing multiple deaths. 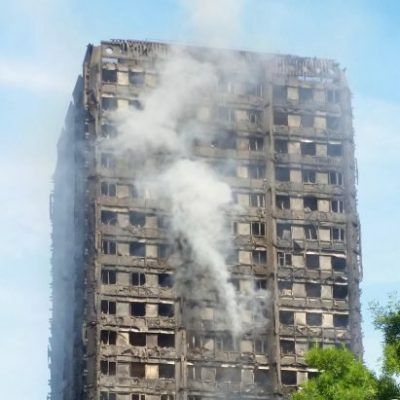 No chartered architect or surveyor, no building inspector or councilor, no manufacturer or distributor and no contractor has yet been brought to trial for liability in the death of seventy inhabitants in a tower block that had been knowingly clad with cosmetic/ insulation panels containing a fire accelerant, polymer foam that burns with the production of highly toxic hydrogen cyanide gas. The lethally toxic characteristics of polymer foams have been well known and extensively documented since at least 1960, by professionals in the building design, civil engineering and construction industries and would certainly have been known to whoever specified and installed this highly dangerous cladding that knowingly converted buildings that were designed to be inherently safe, into potential fire traps. As these actions were clearly criminally negligent, why have those responsible not been already apprehended pending trial but have instead been afforded the opportunity to leave the UK, should they so wish? No indictments have apparently been issued and no passports have been impounded by the court, meaning that the perpetrators of the criminal negligence that led to the loss of at least 70 lives, are ostensibly being allowed to avoid justice. The apparent prevarication and inaction by the authorities makes a mockery of the law and confirms that they hold the lives of those who live in tower blocks, very cheaply indeed. And that is an absolute shocking indictment of British government in the 21st century.